Today Washington Times serves up a real Halloween treat: A Q&A with Ted Nugent, living symbol of the Psychopath Vote. So I’ve used the scariest Ted photo I have, one where he’s in his best Deliverance-style pose, a dangerous scowl just before beating a houseful of blood-sucking Democrats to death with his acoustic guitar in Haddonfield, Illinois. Enter the liberal death wish of Mayor Coleman Young and a tsunami of negative, anti-productivity policies by liberal Democrats that put a voodoo curse on our beloved Motor City. When you train and reward people to scam, cheat and refuse to be productive, there is only one direction that society can go: straight down the toilet. It is truly a heartbreaker. Some wonderful people are still to be found back home, but they are outnumbered by the pimps, whores and welfare brats that have made bloodsucking a lifestyle. And now we have a president who is doing everything he can to take the whole country down that same path. Surprisingly, Nugent has not yet advocated for shooting cats this year. But there are still two months left. Sage Keffer is a young man with huge ambition. He is a country kid who grew up fishing and camping and always wanted to be a country music star. 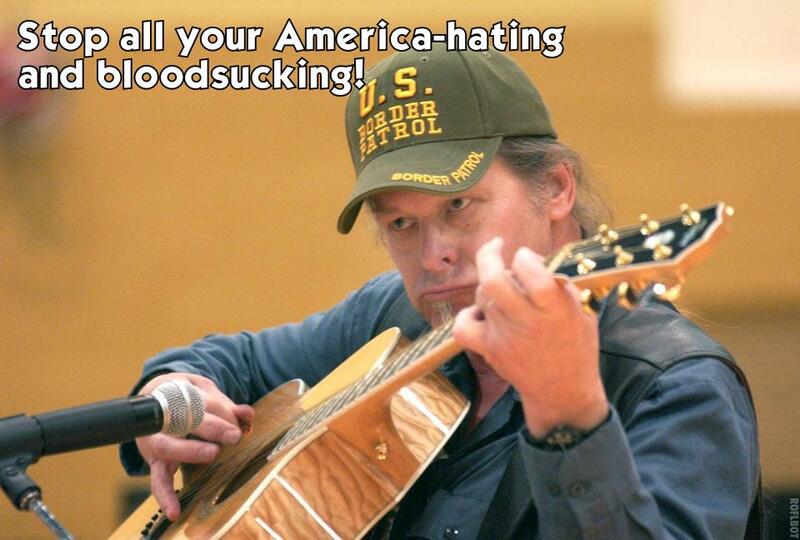 So, he thought it was a perfect fit to compete on an outdoor survival show hosted by Nugent. “I said, ‘what’s the prize?’ They said, ‘well, CMT has not told us yet, but you’re going to be blown away,'” Keffer said. Then, about one year later, the show still had not aired, and Keffer’s emails about the prize had gone unanswered, when one night he received a Facebook message from a fan who said they had just seen Keffer competing on CMT. What his fans did not know was that all Keffer got for his victory was a set of bleached antlers. “I didn’t go down to Waco, TX, just to be tortured,” said the contestant. Well, yes, yes, he did. And DD blog had a joke about it in June.